I hear this often and to be honest, turning 40 is young, especially to me! It seems when some of us change our decade we think things have to change or we have to give things up/change things. Personally I think this would be a major blow to the system, as they say age is merely a number. I would rather look at it like if it ain’t broken don’t fix it! Now when it comes to Style, dressing for your body shape is my best advice. On that note, mature ladies can have great figures but there will be areas that will let them down. I’m talking from experience here : it may be that your abs aren’t so taught or your bust isn’t sitting so upright. Another common one is your knees start to relax so this may be time to start wearing a longer hem line, once that skims the knee or below. So, when I say dress for your body shape, these are all things you need to take into consideration. As mentioned 40 is young and generally we are looking younger through the decades. A good anti-ageing skincare routine is important, SPF is a must, exercise and a healthy diet will all go a long way to keeping us younger and fresher. Need some product help, check out my anti ageing products. Below are some things to incorporate into your wardrobe and your life, I won’t put a number or an age on when you can think of needing to use these tips because only you know when you need to. As fabulous as it may have been in your 20’s and 30’s, black can appear a little harsh now. I’m not suggesting you toss it completely. It remains a classic option for some great pieces in your wardrobe. Now is the time to be more aware of the colours you wear close to your face. The harshness of black can emphasize signs of aging and tiredness, depending on how you wear it. You do have other options. Your personal stylist can help you find your best suited colours. It’s a wonderful experience getting to know your colours and wearing them. Check in here. A collared shirt will do wonders for a wiser jaw and neckline. It has the effect of providing some coverage for this area and creates the illusion of taking the eye up. You can try wearing the collar standing up at the back and gently slant the points down in front of your face. Illusional dressing! You have no option now but to keep yourself looking 100% current. Dated clothing zaps your confidence. This means that you just can’t wear that sundress that has been sitting in the wardrobe for the past 5 -10 years. Seriously, only classics last this long! Replace quality basics as they tire and inject 2-3 new pieces each season that work back with everything else. The best way to do this is with the assistance of a professional stylist doing a wardrobe audit. Glasses must be updated every two to three years. Wearing current scarves and jewelry is crucial now. Don’t be afraid to get a little radical here. You can carry it. 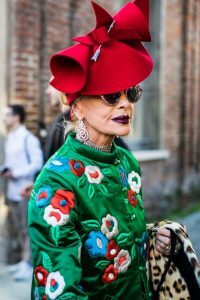 I think this picture from Pinterest of a lady owning her look, her style and her fashion personality is something to truly aspire to. She has an air of confidence and a little bit of radical that as we age gracefully can make claim to. I’d love to hear your feedback, your experiences and your thoughts on this blog so go ahead message me!